"You claim to have put HEXAGON out of action?" he asked wryly. "Look again!" Black Lys. Plasma. Rakar. The Mysterious Archer. The Dark Flyer. Together they form Hexagon, the world's most powerful team of superheroes! But since the death of their leader Jeff Sullivan, the Man of Brass, they have gone from failure to failure - the mystical bond that united them is broken, their single sense of purpose seems to have disappeared. When a mysterious enemy emerges from the depths of time, determined to destroy them, Hexagon must find a replacement for Jeff who can restore their balance, but will this new member also spell their doom? 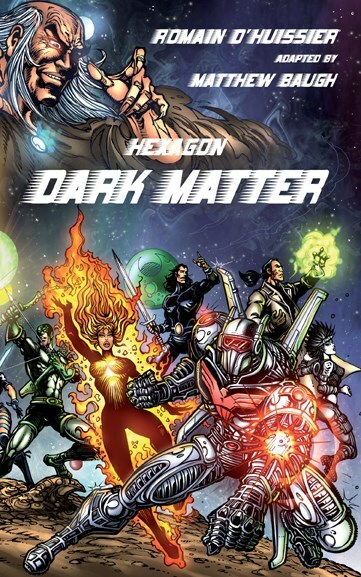 The Hexagon Universe is France's oldest and most exciting comics universe, having begun in 1953, and today encompassing hundreds of characters and thousands of stories, published in a half-dozen countries. This first novel, written and adapted by two of the Tales of the Shadowmen writers, based on some of Hexagon's best-loved characters, is a perfect entry point into this thrilling and wonderful universe.